Most of my eating in Hong Kong this trip could best be described as the Curry Puffy Cuisine Crawl, since most of the recommendations came from Gary’s suggestions based mostly on his December trip back to Hong Kong. Each time I return to Hong Kong, eating good food is a central objective. This time was no exception. 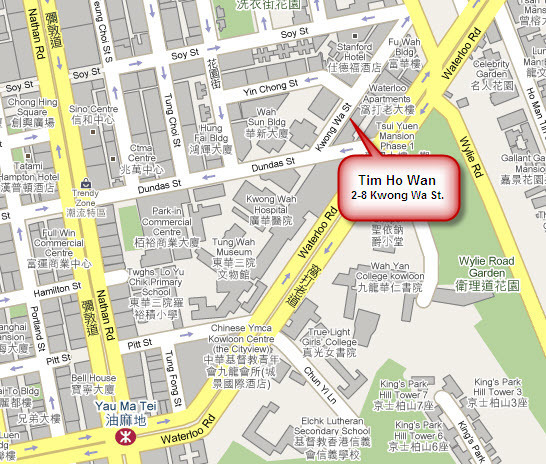 Tim Ho Wan is the least expensive, and perhaps the unlikeliest, Michelin-starred restaurant in the world. Its one star shows that Michelin can overlook dismal locations and lack of pretty presentation and focus its attention on the food. 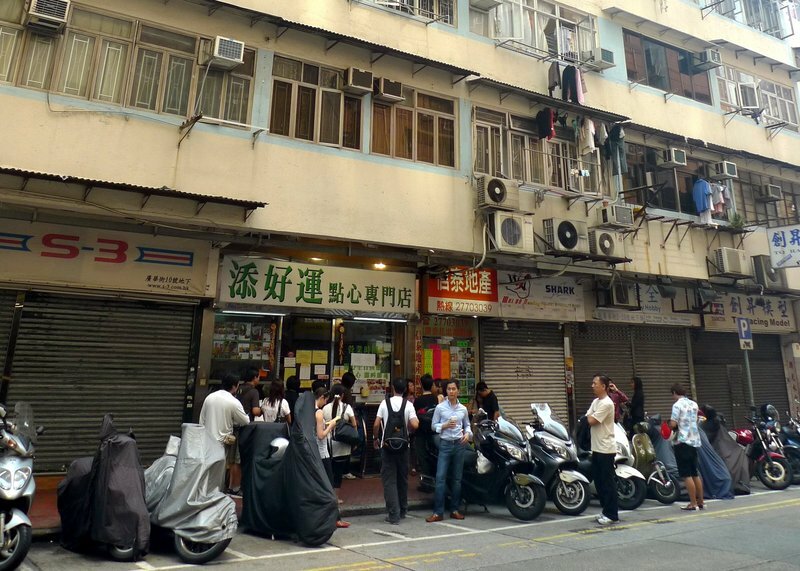 Located several blocks from the Yau Ma Tei MTR station, this restaurant was opened by the former dim sum chef at Hong Kong’s Four Seasons Hotel. It is fair to say that the only things missing are the fine china and refined ambience. 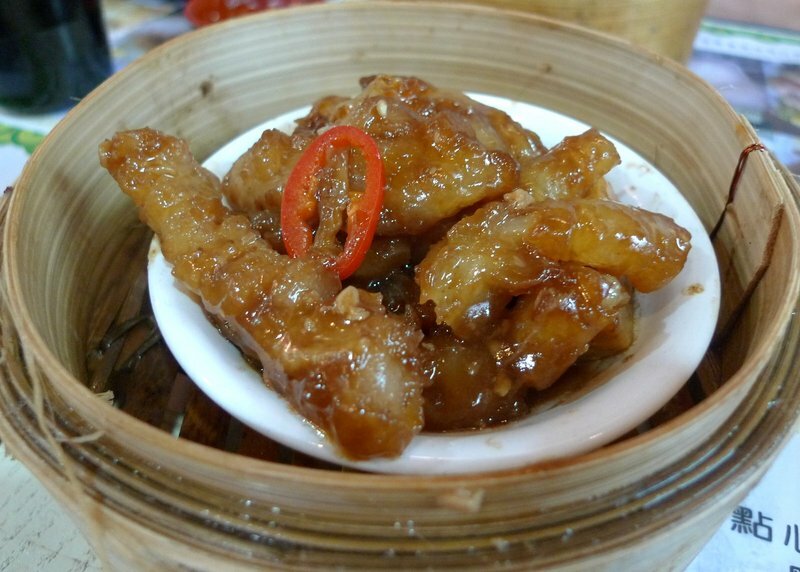 The quality of food is exactly what you would expect from the highest calibre restaurant, especially when it comes to dim sum. I think most of you know that dim sum (yum cha in Cantonese – “drink tea”) is the original “small plates” dining experience, a breakfast/brunch type meal that features small dishes with dumplings, noodles, buns, and other tasty morsels. 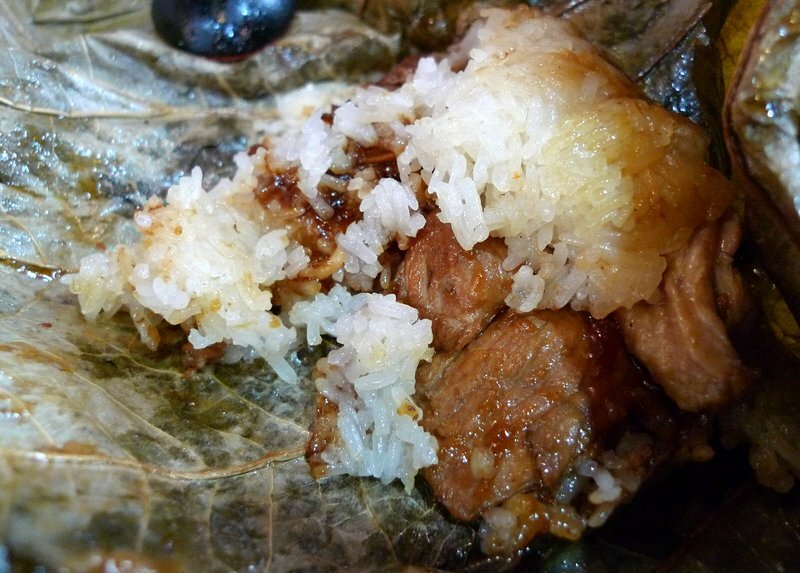 Eaten with a group, it is an excellent way to enjoy many flavors and textures while socializing. Good dim sum is light and refreshing, made with high-quality ingredients. Bad dim sum is heavy and made with whatever scraps were leftover from the previous night’s banquets. 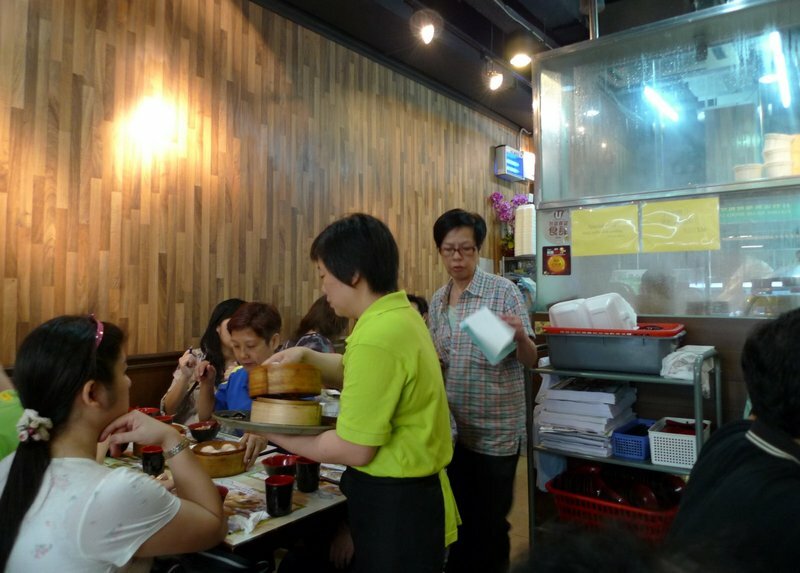 Even at 10:00 on a weekday morning, there was an hour wait for this twenty-seat restaurant. Instead of a queue, customers took their number and wandered off, coming back closer to their estimated seating time. While waiting, a few other gweilo (foreigners) arrived, including a couple from San Francisco, foodies with whom we struck up a conversation. Non-Chinese speakers need to pay attention or learn how to count in Cantonese, otherwise they might be passed by! Even with a local friend waiting with us we still managed to miss our number. 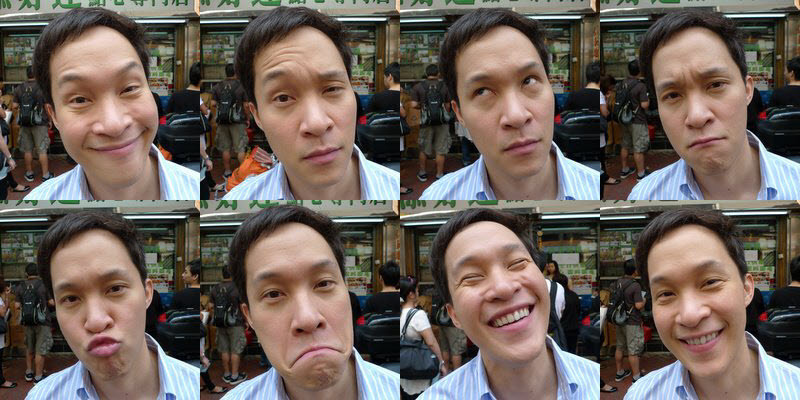 With an hour to kill, Tawn entertained me with his many expressions. Lest you think an hour is a ridiculous amount of time to wait, let me assure you that this was one dim sum place worth waiting for. The restaurant itself is nothing fancy. This was about half of it. I wanted to go take a picture of the kitchen but knew if I didn’t get yelled at, I’d get run over by the workers. This is a no-nonsense place attentive to just one thing: turning out good dim sum. The highlight of the meal was the barbecued pork buns. Unlike the usual steamed buns, these were lightly fried, so were flaky and crispy at the same time. 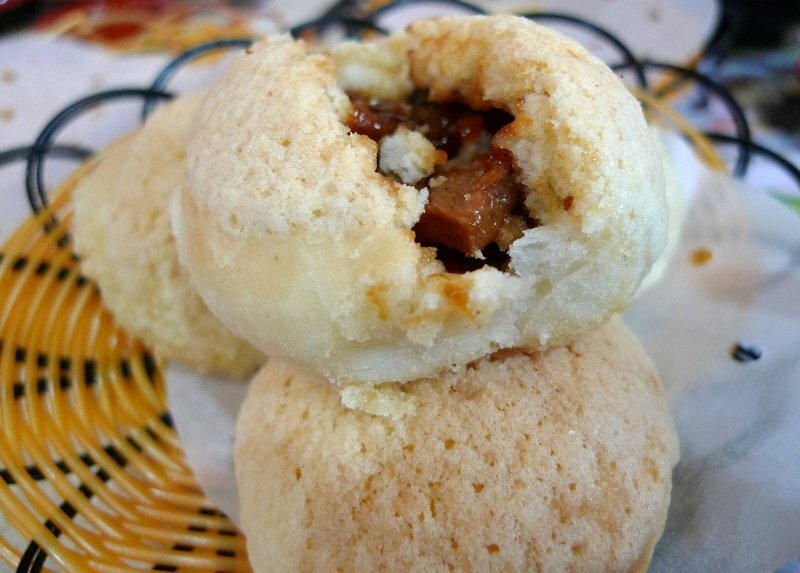 The pork filling was made of good quality, sizeable pieces of pork rather than the ground-up remnants of yesterday’s pork that you so often find in these buns. These are cooked several dozen at a time so the waitress will bring out nearly all the tables’ orders at once, causing much ooh-ing and ah-ing around the room as diners taste these succulent treats. We placed a second order (plus two additional orders for our friend Michael to take home) after we tried this first basketful. Har gow, steamed shrimp dumplings, were very nice, too. A good measure of dim sum quality is how thin and translucent the wrappers are. Thick, heavy wrappers are coarse and filling. These wrappers were almost transparent, very pliable, and light on the tongue. 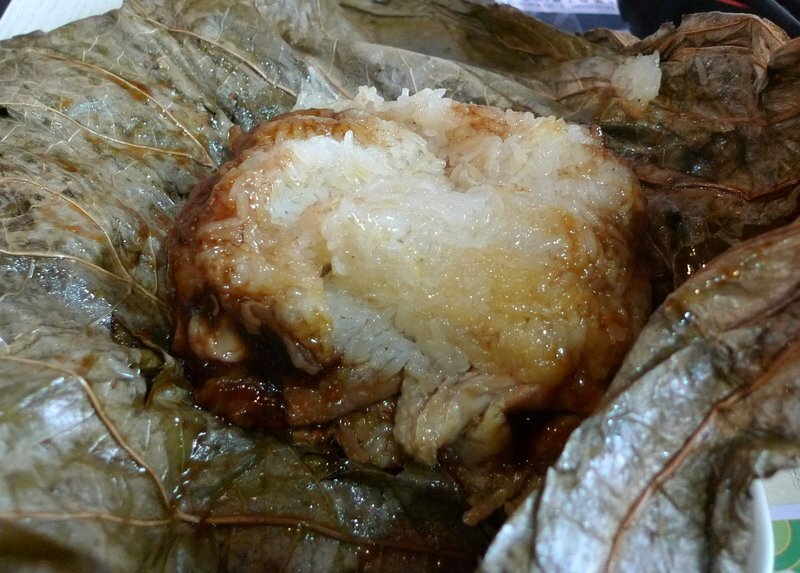 We ordered another typical dim sum dish: glutinous rice stuffed with meat and other goodies and steamed in a lotus leaf. Again, instead of the usual barely identifiable contents, there were large slices of good quality pork loin and vegetables inside. Very tasty! Siu mai, steamed pork dumplings with shrimp, were also very tasty, again with a light skin and good quality ingredients. 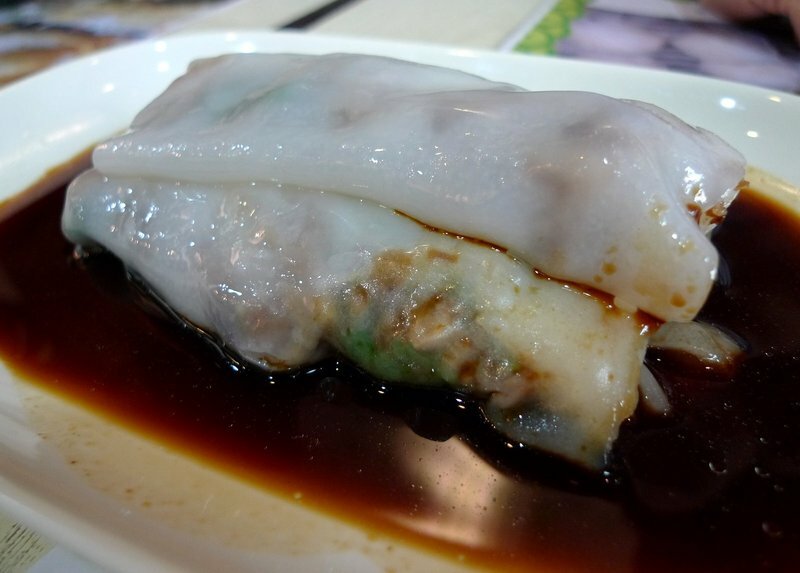 One of my favorite dim sum dishes is the rice noodles stuffed with shrimp or pork, served with a soy sauce. We had pork in ours and found it to be a really lovely dish. The theme kept repeating: light, delicate wrappers with generous, high-quality fillings. 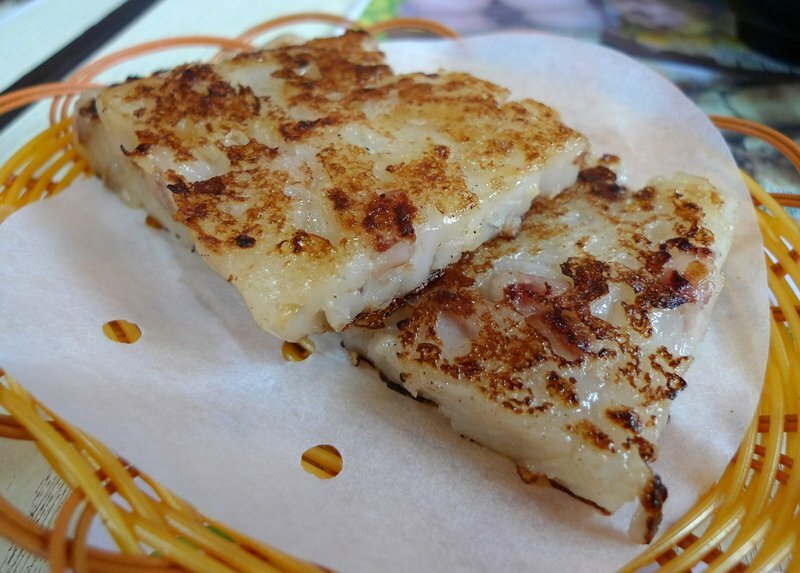 My favorite dish, second only to the barbecue pork buns, was the fried daikon radish cakes. These are made of shredded daikon, seasoned with bits of pork, and then pan fried until crispy. The perfect cake is delicate and creamy inside with a crisp exterior that isn’t too oily. These were ideal. Tables were shared and so the three of us dined with an old granny, who informed us that she was having her usual lunch of deer tendons and a bowl of noodles. She explained that the collagen from the tendons kept her looking so young. I have to say, she did look youthful, so we ordered a dish. The texture is a lot like eating pig knuckles, the cartilage is soft and flavorful with a sweet soy sauce. 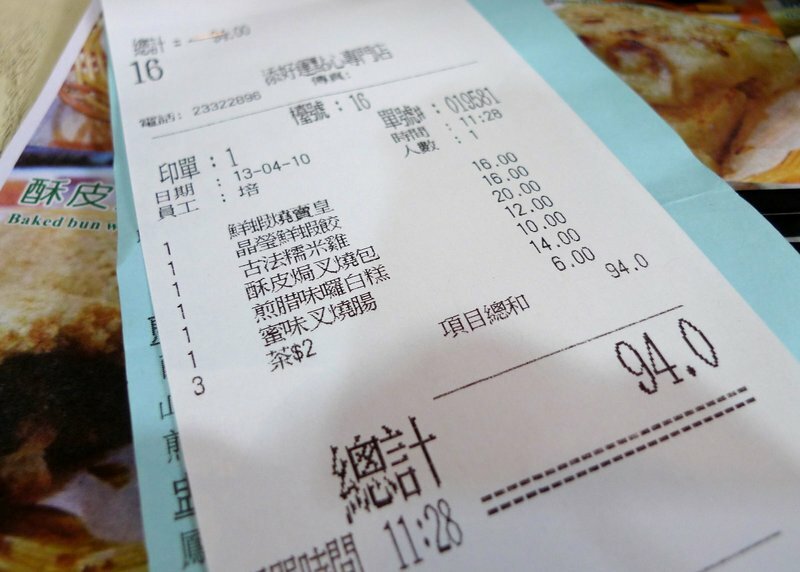 The total before we ordered the deer tendons and three extra orders of barbecue pork buns was only HK$94 – about US$12. At a price like that it and with quality like that, it was well worth an hour wait. 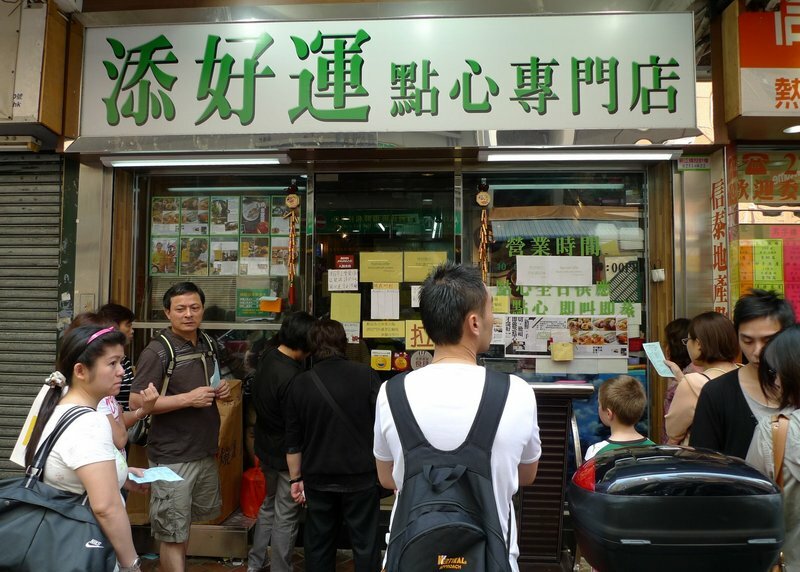 This entry was posted in Uncategorized and tagged Dining, food, hong kong, Kowloon, tim ho wan, travel by christao408. Bookmark the permalink. You know Hong Kong better than I, especially about eating out! omg – those pork bao look good ! And I’ve never seen siu mai filled so full. What a wonderful looking meal! wow. cheaper than SF! 🙂 I thought HK is expensive..
OMG! omg omg omg. 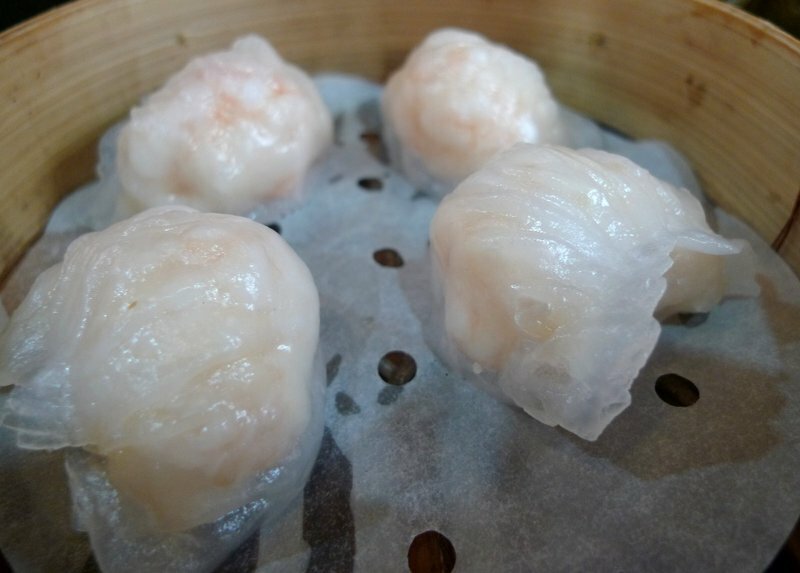 i want to go to dimsum so badly..x_x. those bbq pork buns look so delicious…one of my fave is also the rice wrappers stuffed with shrimp.. i can prob eat 15 of those by myself..
Wow that is cheap–the whole bill is how much it would be per person here in Vancouver!! And very close to our hotel!! =) BTW–great post. I had dim sum today, and can have it again! Great social thing to do. holy cow that was cheap! Am I allowed to say that that food does not do it for me. I like westernised Chinese food. With all the spices and sugar. wow, that is some really good dim sum! and so cheap! dim sum is also sadly lacking in baltimore… i hear there’s a decent place not too far away closer to dc, but i haven’t ventured down there yet. i also love lo bak gao (daikon cake). in fact, with the exception of the deer tendon (which i’ve never seen on a dim sum menu before), you posted pictures of all my favorites! Cheap good food, my faves. Look at the texture of the food… really amazing. Wow! That meal was seriously only $12. I don’t know where else you can get such a good meal for three people for that paltry sum. It looks so good. This is another case where I wish I could taste the food through my computer screen! @stevew918 – Definitely worth a visit. @TheCheshireGrins – For the price it was amazing. Even if had cost three times as much, it would have been well worth it for the food. @Dezinerdreams – It is, right? @Roadlesstaken – A winning combination! @kunhuo42 – So the sushi is a no go in Baltimore, the dim sum is a no go. Gosh, if it wasn’t for the crab cakes you would be in really sorry shape there! 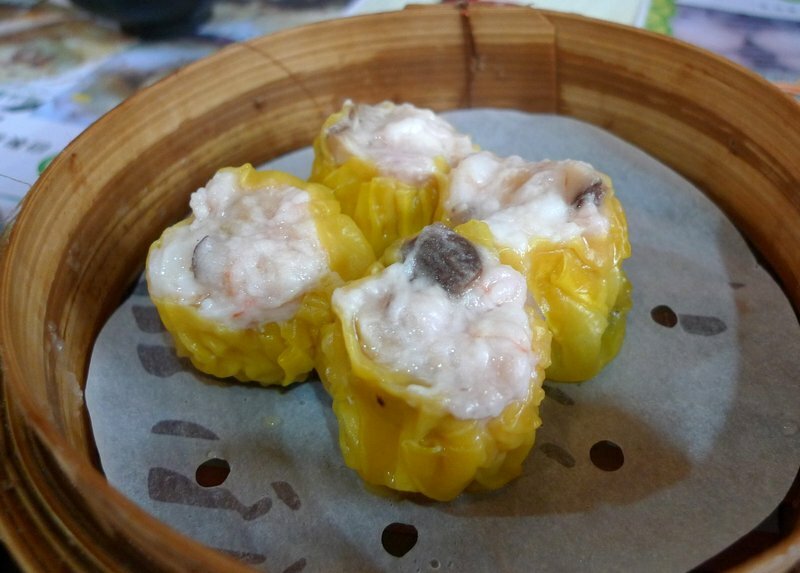 =D@iskrak – Yeah, those were one of the first dim sum dishes I remember from when I was in junior high school and my friends (whose parents were all from HK) took me to dim sum. At first I found the texture of the noodles kind of odd, but very quickly fell in love with them. @Umnenga – You’re allowed to say whatever you want. Of course, I’ll just have to tell you how much you are missing out! Ha ha…@wolf__parties – Welcome, welcome. Stay in shape? Do I do that? Actually, while I try a lot of different kinds of food, I try (as best I can) not to eat too much of it in one go. @lil_squirrel4ever – @YNOTswim – @LostSock21 – Amazingly so. I was really shocked at how inexpensive it was. @slmret – They were generously stuffed, yes! @CurryPuffy – @choyshinglin – Everything I know about HK restaurant (well, almost everything), I owe to Gary. @christao408 – yeah, no kidding. although for whatever reason we do have a decent korean population, so the korean bbq is good! @Wangium – I’d include it as a stopover on your way to Thailand. =D@CurryPuffy – No, no… your listings really top all the ones I’ve had so far in terms of consistent quality. @kunhuo42 – Thank goodness! @yang1815 – Yes. Wow Chris! My favorite dish is the fourth picture, second from left!! I LOVE IT. I think this would be where I’d camp out for lunch and dinner – unless they serve breakfast. Then I’ll queue up early! Maybe I’d better go have dinner before reading any more… And Tawn is silly. Does he know you posted all his funny faces? @SufiLover – Top row or bottom row? @murisopsis – Um, he hasn’t said anything so I think he doesn’t know that I posted the pictures. He wanted me to delete them but I think they are a good representation of his light-heartedness.